Our locations: Here you find us! 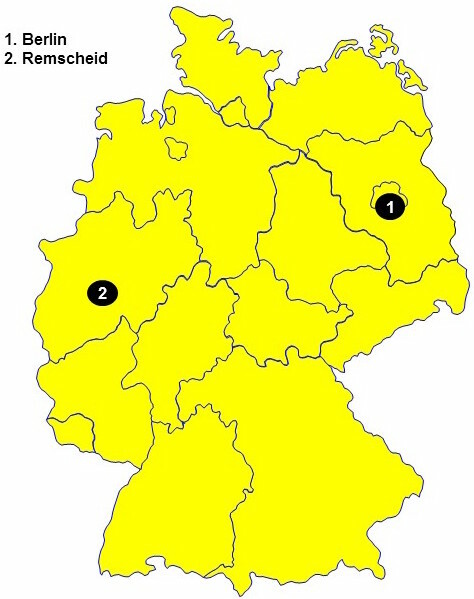 Our locations are situated in Remscheid and in Berlin. NICO Europe can look back on more than 100 years of market expertise in the fireworks branch and counts to the leading suppliers for pyrotechnics in Germany. Since November 2015, the companies Nico-Lünig Event GmbH, Wuppertal, and Pyro-Partner GmbH, Berlin, operate consolidated. More than 4,000 retailers all over Germany count on NICO Europe's service and customer proximity. We always focus on the requirements of our customers. That applies to you, too. We would be glad to be at your service at one of our locations. Too far away? Alternatively, you can of course also contact us by telephone or E-Mail at any time.